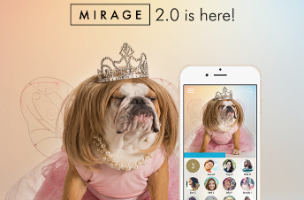 Mobli Media has announced the launch of Mirage 2.0 on mobile devices, an updated version of its privacy-focused instant messaging app. When using the app, users send and receive messages that disappear after a few seconds, with this new update introducing two new ways to share a Mirage message with others, including several contacts at once. Mirage allows users to send messages to others within the app, or even outside of the app (via links sent through SMS). In this update, users can create groups of users and start the same disappearing conversations as they would in one-on-one environments, but with a group of multiple people. In addition, users can simply “broadcast” a message, sharing it with multiple contacts at once, but without taking the time to organize these users into a group. The overall Mirage app allows users to share pictures, text messages, videos and audio messages with their friends, which disappear a few seconds after they’ve been accessed. Users can add text and emoticons to pictures, and other app updates introduce a search bar to the app’s home screen, alongside an inbox for quickly viewing all of the messages in one’s queue. Mirage 2.0 is available to download for free on the iTunes App Store and Google Play. The app now supports 22 languages.